Steven Abbott Associates LLP has won an appeal which secures the retention of a yurt and cabin in the grounds of Broughton House which is a Listed Building near Cartmel in the Lake District National Park. 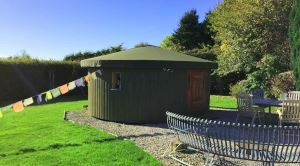 The cabin and yurt provide holiday accommodation in connection with the owner’s bed and breakfast business at Broughton House. A planning application was refused by the Lake District National Park Authority on the grounds that the development harmed the character of the landscape and the setting of the Listed Building, and also that visitors would be reliant on private cars. When considering the appeal which was lodged by Steven Abbott Associates, the Planning Inspector concluded that the appeal proposals did not have a negative impact on the landscape character of the area or the setting of the Listed Building. The Inspector also concluded that whilst many visitors were likely to use private cars to visit the site, there are a range of alternative transport methods available. For further information on Steven Abbott Associates LLP's expert team and the services provided please contact us on 01539 724766 or via email.